The Investec-songo-Specialized pair removed any doubt they are going to be the team to beat this week as they powered along the slopes of Table Mountain and completed the 20km stage in a time of 51 minutes and 44 seconds. They will take a big two-minute 35-second lead into Stage 1 which starts and finishes in Hermanus on Monday. Ariane Lüthi, who partnered Langvad to three Absa cape Epic wins, and Maja Wloszczowska from the Kross-Spur Racing team ended second in the Prologue, with Summit Fin’s Candice Lill and Adelheid Morath third, 14 seconds further back. Langvad and Van der Breggen were the final pairing from the elite women’s race to set off in the time trial format and it was quickly obvious they were the team to beat. When they passed the first intermediate timing point after just six kilometres they had already negotiated the early climbs a massive 66 seconds quicker than any of their rivals. Effectively the Danish and Dutch World Champions had reduced the stage – and probably the entire event – to a race for second within six kilometres. At the highest point of Sunday’s stage, after 16km and just before the riders began the more technical downhill sections back to the finish, Langvad and Van der Breggen had doubled that lead to over two minutes, giving them a cushion to ride a controlled descent back to the start/finish. They made sure there were no mistakes and crossed the line with a healthy, morale-boosting lead over all their rivals. “Getting a good start is always very important,” said Langvad after the finish. “It is good for the morale and good for the motivation. Van der Breggen was relieved and pleased to have the Prologue behind her. As a road rider there were question marks over Van der Breggen’s speed in the technical sections but the current Road World Champion has established her credentials and was even lamenting the fact she had to slow down at times. 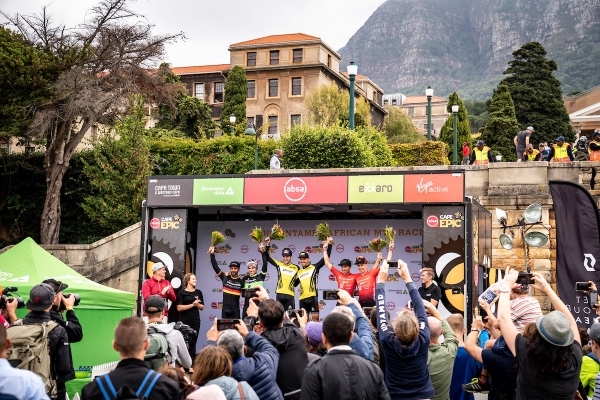 Sanders and McDougall will take a 33-second lead into Stage One on Monday after the Galileo Risk team of Theresa Ralph and Sarah Hill were penalised 30 minutes for drafting.